The mission of the Institute for Space and Defense Electronics (ISDE) is to contribute to the design and analysis of radiation-hardened electronics, the development of test methods and plans for assuring radiation hardness, and the development of solutions to system-specific problems related to radiation effects. ISDE was launched with initial support from the U.S. Navy Strategic Systems Program and C.S. Draper Labs. 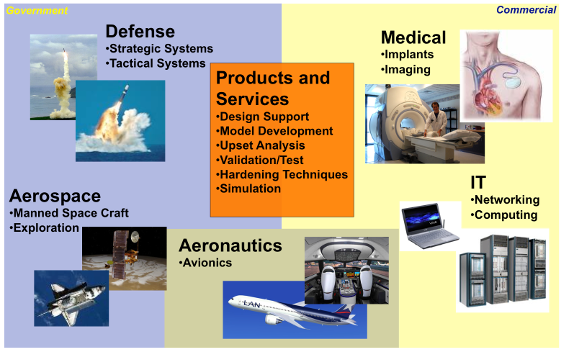 In addition, ISDE currently supports the Defense Threat Reduction Agency, Arnold Engineering Development Center, NASA Goddard Space Flight Center, NASA Marshall Space Flight Center, Boeing/Defense Advanced Research Projects Agency, Naval Research Laboratory, Air Force Office of Scientific Research, Department of Energy, BAE Systems, and Cisco Systems. Expertise includes, but is not limited to, Intersil, Honeywell and IBM/GF processes.